One of the most frustrating aspects of drawing with a wet medium is the accidental smear that results from not allowing ample time for the ink to dry. A smear can result from an object coming into contact or sliding across a wet part of a freshly drawn line or painted surface. Any artist/creative who has traditionally worked with colored pencils, watercolors, pen & ink, and even digital art can benefit from working with markers. Where do you most often sketch? What speed do you work at? How do you like to sketch? As you can see there are many different uses for markers because they are so adaptable for different applications and portable. You can now get a sense why there are so many materials available and how they have evolved out of the many new uses. They key is to play around with lots of materials, try them out and find which ones work the best for you. It would be really hard to make a mistake but you will start to see which ones behave the way you like. 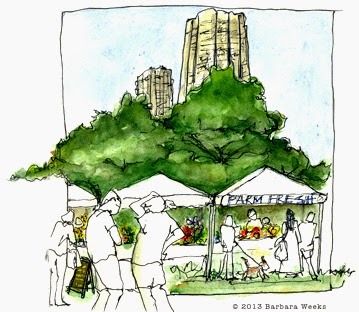 Many people that I meet at the Urban Sketchers Chicago Sketch Crawls will ask me about using markers and some of my techniques. In my continuing series on urban sketching with markers, I must address the question “which markers and why?” And while I may have 30 years working with these wonderful little tools of the trade, please know that the following is merely from my perspective and experience. There are plenty of other marker artists that will tell you which materials work best for them and I welcome that feedback in the comments below. As you can see (from the attached photos) you will notice the wide assortment of marker brands, marker types and paper pads available for the marker. You can appreciate how the materials have evolved out of the many sketch needs. There are several reasons for this. Most markers are alcohol-based and tend to soak through papers that do not have some kind of coating or seal. The trick is to find a paper that you like that does not have such a heavy coating that it dries out your marker at an abnormally fast rate. Most sketchbooks rated for sketching or drawing will be sufficient as well as those books rated for watercolor. Pages in the sketchbook or paper pad that are very thin run the risk of bleed-through unless they are “marker” papers. Additionally, thin sheets will prevent you from sketching on both sides of the paper—a popular technique employed by urban sketchers. When I work with markers, I am a big fan of super-smooth papers because I can keep my line work clean. A slight tooth (or roughness) to the paper can also work in your favor if you wish to add texture to your sketch. For years I have used Graphics 360 (by Bienfang) as my paper of choice because I can put my rough sketch underneath the top sheet and put my marker color down and finish it off with a clean line work. For urban sketching, I have a heavier weight sketchbook where I pencil my rough sketch, add marker tones and then finish with a black line all on the same page. Because the sketchbook paper is thicker, it is harder to see a rough sketch under the top sheet for tracing. At the risk of sounding like I am a paid spokesperson for any particular brand, all I can tell you is that I have been a big fan of a few different brands because I like how they lay down color for the way I work. What works for me may not work as well for you but that is why there is a Tip #3 below. I was introduced to the Design® Markers (by Eberhard Faber) when I first began as a graphic designer. Over time, I switched over to Prismacolor® Markers (by Sanford) because the odor is far less overpowering. There is a different kind of alcohol used in Prismacolor markers and odor is definitely something you should consider when trying out different markers. The other thing I like about Prismacolor markers is that there are two different tips on the same marker barrel. This can save you space and time when you are packing a travel sketch kit. My newest favorite markers came at the suggestion of fellow Urban Sketcher Donald Owen Colley: Pitt® Markers (by Faber-Castell). I have a set of 4 Cool Grey and 4 Warm Grey markers. These markers do not bleed–through most any kind of paper I can throw at it–and the pointy brush tip allows me to get into tight spots as well as cover broad areas with ease. Do yourself a favor. Print out the attached photos of the markers and the marker paper selections, bring them to your favorite art supplies store and look for as many of the brands as you can find. Many art stores will have some kind of scratch pad around so that you can try out each marker. Purchase one marker of each brand that you like and test-drive each marker for a few days. In your different sketch situations, you will see how well the markers respond to how you work. You can always go back and pick up more colors later, but make sure you like how one marker works for you first. I recognize that I did not have much technique in this week's post, so in my next post I will go over some more techniques and tricks with markers. Good luck and have fun discovering your new sketch friend. A month ago we started talking about composition in sketching in a post Composition is a Big Word. Today we will continue discussing composition and talk about several rules. The Rule of Thirds is an easy compositional rule to remember. Splitting an image in half vertically or horizontally produces a sketch with a point of interest squarely in the middle. This can be just a little bit boring. Instead divide a page in thirds both horizontally and vertically, and place the focus of the sketch in one of the spots where the lines intersect. As a result a viewer eye is drawn to the strongest point in one of the intersections, then around the sketch following the lines of the object. At first it may be helpful to draw the lines to section the drawing in thirds and use them as an aid to find "sweet spots" as they are sometimes called. After some practice the lines will become unnessessary and you will just see where the strongest impact spot is. 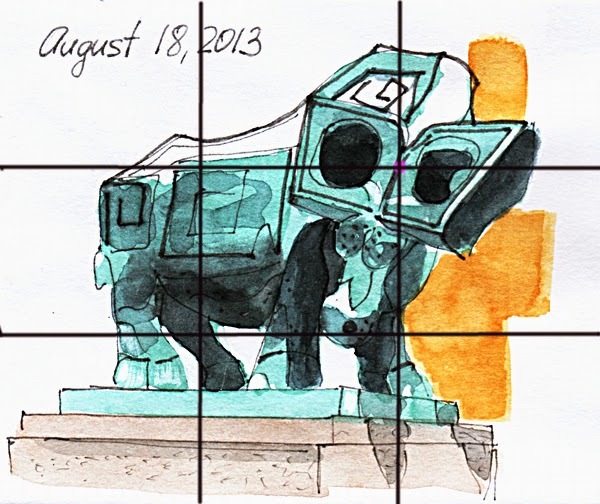 If you do thumbnail sketches first, draw the grid of thirds on top to check the composition. How many of anything is included in a composition makes a difference. An easy thing to remember is that odd is better than even, an odd number make a composition more dynamic. 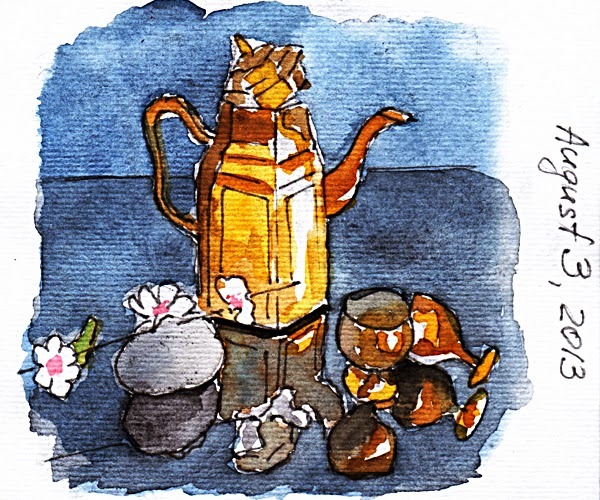 When there is an odd number of objects in an drawing it is harder to pair them up, which we do subconsciously, and this means that we will be staying in the drawing longer and keep our eyes moving within the drawing. Of course if we are sketching in a sidewalk cafe and drawing four people sitting at a table in front of us, skipping one or inventing one extra may not be the best solution. Instead we can be creative and check for interesting reflections, or a shadow, or a pigeon! There are 6 bottles in this drawing - an even number, but 3 strong and interesting shadows bring the number of shapes to 9. For a good composition we want to have a full gamut of values in the image: from lightest lights to mid tones to darkest darks. If we have this variety of values, the drawing is already pretty good. For a really strong composition the lights, mid tones and darks need to be included in different amounts. Here's a simple way to remember it: "two thirds, one third, and a little bit." For example, "two thirds of dark, one third of mid tone, and a little bit of white for flowers and highlights"
No discussion of composition is complete without talking about Golden Ratio. 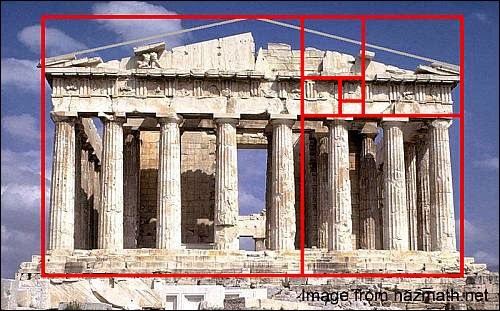 This magical ratio is also known as Golden Section, Golden Mean, Golden Number, Divine Proportion, Golden Proportion, Fibonacci Number, and Phi. Leonardo da Vinci used Golden Ratio in his paintings quite a lot. This is an extremely interesting and beautiful concept. I enjoy reading about it, but was unable to use it when sketching on location - it is a matter of time. So I cannot talk about from a practical standpoint. Instead I would like to refer you to this article on Empty Easel blog - Golden Section for Artists. I hope you find these thoughts on composition useful and would love it if you will use them in your sketches! As artists we each have a unique voice that we express in our work. It’s our point of view, our style. We also have another voice, the little voice in our heads that speaks to us when we draw. It may be small but it’s powerful and really influences how we draw. The first set is the voice of the critic. It speaks to us of drawing as a noun, judging what we’ve done. The second set is the voice of the coach. It speaks to us of drawing as a verb, helping us to observe our subject, get lost in the act of drawing and render what we see. One is negative and self-defeating, the other is positive and constructive. You’ve heard it here before – practice, practice, practice. In this case you really practice what you preach.